Standard dancing (prechampionship final) at the 2006 MIT Ballroom Dance Competition. Ballroom dance refers to a set of learned partner dances, which are enjoyed socially and engaged in competitively around the globe. Any of the various social dances, such as the fox trot, tango, or waltz, in which couples follow a conventional pattern of steps, is considered a ballroom dance. The waltz is credited with having been "invented" in Austria, the foxtrot is a purely American creation, and the tango is known to have originated in Argentina so ballroom dance has a truly international following. In recent years Ballroom Dance has experienced a resurgence of popularity, in stage, film, and on television. Its structure, grace, and elegance affords people not only social contact and recreation, but the added benefit of exercise combined with physical expression. Ballroom dance has a broad based appeal that reaches young and old alike making it a popular pasttime that crosses gender and generational boundaries. After a review by the International Olympic Committee, ballroom dancing received the categorization of DanceSport and will be considered as an additional sport offering for the 2016 Olympics. The term "ballroom dancing" is derived from the word ball, which in turn originates from the Latin word ballare which means "to dance." Its evolution most likely came from simple folk dancing enjoyed by the peasant classes which were then formalized by the upper class nobility during the time of the Enlightenment. Ballroom dance dates back to at least the era of court balls lavishly conducted by the Ancien Regime of France under Louis XVI in the 1700s and of the other European aristocracy of England, Austria and Russia. In her memoirs, Souvenirs Madame Elisabeth Vigee Le Brun, official portraitist to Marie Antoinette, said of dance in her era, "They danced the waltz with such frenzy that I could not imagine how all these people, spinning around at such rate, did not get giddy and fall down; but men and women are so accustomed to this violent exercise that they did not take a single break as long as the ball lasted. They also frequently danced the Polanaise, far less fatiguing, for it is nothing more than a procession during which twosomes promenade in stately fashion. It marvelously suits pretty women as it affords all the necessary time to admire their figures and faces." While the Puritans who settled in the New World discouraged dance of any kind, ballroom dance still found a welcome reception among colonists. John Quincy Adams once participated in a dance marathon and George Washington raised eyebrows by dancing with a female partner for three full hours. In fact it is at George Washington's inauguration that the precedent for ballroom dance in the new republic was established. At eighteenth century assembly balls participants danced the minuet, the cotillion and the allemande. Gentlemen were instructed to not use coarse language and to lay aside their swords at the door. In 1823 dance was made an official course taught at West Point Academy and in 1885 Alan Dodworth, a preeminent dance teacher, wrote, Dancing and Its Relation to Education and Social Life, codifying five basic positions of good dancing. Teachers in both England and the United States, from the 1870s on, began to form professional associations and established a ballroom style that was formal, polished, and elegant, and still forms the basis of competitive dancing today. Today, the term Ballroom Dance may apply to any one of the several dances in which two individuals, a "leader" and a "follower," dance with physical contact through their upper or lower bodies, or simply through their arms depending on the particular dance. Since most social dancing is not choreographed, this contact is necessary for the leader to communicate the next dance move to the follower, and for the follower to respond to this lead. This stands in stark contrast with the style(s) of dance seen in clubs and other social gatherings where physical contact tends to be optional and the individuals in question can move freely without any such restraints imposed by firm physical contact or by the necessity to follow the rhythmic pattern present in the music. Some knowledge of step patterns is essential for both the leader as well as for the follower to be able to effectively practice the art of ballroom dancing. Dance historians usually mark the appearance of the twist in the early 1960s as the end of social partner dancing. In the modern dance era, dance became less structured, and less dependent on knowledge and special training. However, during times of economic crisis and war, ballroom dance re-captures some of it popularity as it harkens back to a simpler era when dance could be gracious, formal, and shared by all ages, and both sexes alike. Vernon and Irene Castle, c. 1910-1918. In the 1930s, the on-screen dance pairing of Fred Astaire and Ginger Rogers greatly influenced ballroom dancing in the United States. Although both actors had separate projects and careers, Astaire and Rogers are perhaps most remembered for their dance sequences together, which included star billing in numerous movies such as Top Hat, Easter Parade and Shall We Dance. Their pairing came at a time when musicals were at their peak in American society and culture. Additionally, peoples' longing for idealism and simpler times were heightened by the effects of World War I. One of Astaire and Rogers earlier collaborations involved their portrayal of twentieth century ballroom dance pioneers, Vernon and Irene Castle, whose early work and life reached iconic status after Vernon's heroic death during World War I. Much of Astaire and Rogers' work portrayed social dancing, although the performances were highly choreographed (often by Astaire or Hermes Pan), and meticulously staged and rehearsed. The musical accompaniment to their dance was often written by renowned composers of the era such as Irving Berlin and George Gershwin. In spite of its historical image as a pastime for the privileged, formal competitions, or DanceSport, often allows participation by a range of dancers who are ranked at various proficiency levels. In the United States, amateur dance proficiency levels are defined by USA Dance (formerly United States Amateur Ballroom Dance Association, USABDA) as Bronze, Silver, or Gold for syllabus dancers, and Novice, Prechampionship and Championship for open competitors. These levels roughly correspond to the "E" to "S" levels used in Europe and Australia. Division dances include the categories: International Style Standard, Latin American, American Style Smooth, American Rhythm, and a Miscellaneous category which includes: West Coast Swing, Salsa and Theater Arts. Eligibility requirements vary greatly between countries and sometimes within a country. For instance, in addition to USA Dance competitions, amateur dancers in the United States often participate in competitions sanctioned by the NDCA or YCN (Youth Collegiate Network), each with its own distinct culture in addition to differing definitions of level and eligibility requirements. Ballroom dancing competitions in the former USSR also included the Soviet Ballroom dances, or Soviet Programme. Australian New Vogue is danced both competitively and socially. On the international arena, the Blackpool Dance Festival, hosted annually at Blackpool, England, is considered the most prestigious event a dancesport competitor can attend. Ice dancing, which became a Winter Olympic medal sport in 1976, is a form of figure skating which draws from the tradition of ballroom dancing. In competition ballroom dancers are judged by diverse criteria that includes connection, frame, posture, speed, timing, proper body alignment, proper usage of weight, and footwork. Judging performance-oriented sport such as DanceSport is inevitably subjective in nature, and controversy and complaints from competitors over judging placements are not uncommon. The scorekeepers—called scrutineers— score the dancers through elimination rounds, the number of couples taking part in a DanceSport competition is reduced to a final round, usually comprising six couples. Medal examinations enable dancers' abilities to be recognized according to conventional standards. In medal exams, each dancer performs two or more dances in a certain genre (e.g., International Standard) in front of a judge. In North America, examination levels include Newcomer, Bronze, Silver, Gold and Championship. Each of these levels may be further subdivided into either two or four separate sections. With the new definition of dancesport the term 'ballroom dance' can be much narrower in scope, usually referring specifically to the International Standard and International Latin style dances. In the United States, two additional variations—"American Smooth" and "American Rhythm"—have also been popularized and are commonly recognized as styles of "ballroom dance." The dance technique used for both International and American styles is identical, but International Standard allows only closed dance positions, whereas American Smooth allows closed, open and separated dance movements. In addition, different sets of dance patterns are usually taught for the two styles. International Latin and American Rhythm have different styling, and have different dance patterns in their respective syllabi. Others dances sometimes placed under the umbrella of "ballroom dance" include Nightclub Dances such as Lindy Hop, West Coast Swing, Nightclub Two Step, Hustle, Salsa, and Merengue. 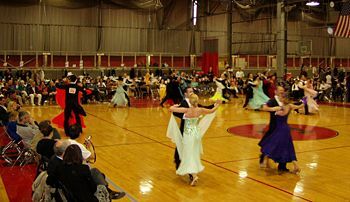 The categorization of dances as "ballroom dance" has always been fluid, with new dances or folk dances being added to or removed from the ballroom repertoire occasionally. In Europe, Latin Swing dances include Argentine Tango, Mambo, Lindy Hop, Swing Boogie (sometimes also known as Nostalgic Boogie), and Disco Fox. One example of this is the subcategory of Cajun dances that originated in New Orleans, with branches reaching both coasts of the United States. Standard/Smooth dances are normally danced to Western music (often from the mid-twentieth century), and couples dance counter-clockwise around a rectangular floor following the line of dance. In competitions, competitors are costumed as would be appropriate for a white tie affair, with full gowns for the ladies and bow tie and tail coats for the men; though in American Smooth it is now conventional for the men to abandon the tailsuit in favor of shorter tuxedos, vests, and other creative outfits. Latin/Rhythm dances are commonly danced to contemporary Latin American music, and with the exception of a few traveling dances (e.g. Samba and Paso Doble) couples do not follow the line of dance and perform their routines more or less in one place. In competitions, the women are often dressed in short-skirted latin outfits while the men are outfitted in tight-fitting shirts and pants; The goal of the dance attire is to bring emphasis to the dancers' leg action and body movements. ↑ The Story of Vernon and Irene Castle, (RKO, 1939) .Imdb.com. Retrieved January 28, 2009. ↑ John Kenrick, History of Musical Film. 1996. accessdate 2009-01-19. Musicals101.com. ↑ Blackpool Dance Festival Blackpooldancefestival.net. Retrieved January 20, 2009. Kenrick, John. History of Musical Film 1930s, Part III. (1996) 2003. Laboy, Suzette. 2007. Ballroom dancing gaining favor as next potential Olympic sport. The History of Ballroom Dancing. Vargas, Jose Antonio. 2005. Ballroom Dancing Is Hot to Fox Trot. Ginsburg, Elisabeth. 1992. Ballroom Dancing Is Back in the Swing Again. This page was last modified on 10 May 2016, at 16:37.